OfficeOutlet.com is the official website and online store of SUK Retail Limited. 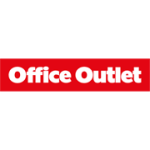 Office Outlet is the trading name of the company based in London. The website sells a myriad of furniture, a plethora of technology products including consumer and office electronics, printers with inks and toners, paper and printing solutions, office supplies and stationery among others. The company represents many top brands. There is a price match promise on most products and services. Free delivery is available for all orders worth twenty five pounds and above. There are offers available on the site and many are communicated through the newsletter.